An international team, which includes several UMCure 2020 participants, has just identified four distinct UM subtypes with clinical relevance. In a team effort that brought together scientists from both sides of the Atlantic (including members of the UMCure 2020 consortium from the Institut Curie, Leiden University Medical Center and the University of Liverpool; see Prof. Dr. Martine Jager, from Leiden University Medical Center, explain the impact of the study in the video below) and analysis of UM samples from 80 patients out of six different research/clinical centers, this study breaks new ground on the characterization of UM biology, potentially opening new venues for more accurate UM diagnosis as well as therapeutic interventions. Applying an enormously comprehensive array of biomedical techniques to UM tumour samples — from profiling their DNA and RNA (the entirety of the tumour’s genes and expressed mRNAs; that is, sequencing, respectively, their genomes using DNA-sequencing and their transcriptomes via RNA-sequencing) and subsequent chromosome abnormalities, to analysing their genomic methylation patterns and miRNA complement — Robertson et al. show that, of the four molecularly distinct UM subtypes identified using gene expression data, both UM tumour groups — monosomy 3 (loss of one copy of chromosome 3; M3-UM) and UM disomy 3 (presence of both copies of chromosome 3; D3-UM) — may each be divided in two subgroups each, with poor-prognosis associated with M3-UM and better-prognosis associated with D3-UM. Taken together, the results of this study point toward molecularly varied UM tumours correlating with differential clinical outcomes, highlighting the need for differentiated UM patient management based on individual molecular profiles. Digest of the study "Integrative Analysis Identifies Four Molecular and Clinical Subsets in Uveal Melanoma"
Please refer to the Graphical Abstract at the end of this primer (also present on the title page of the research article, but here annotated) for easy reference, together with the explanatory text below and the accompanying glossary. Chromosome aberrations already know to be important in UM — Monosomy 3 (loss of one copy of chromosome 3, strongly correlated with mutations in the BAP1 gene); and Disomy 3 (presence of both copies of chromosome 3, strongly correlated with mutations in the EIF1AX and SF3B1 genes) — were each found to divide into two further distinct subsets, with additional molecular specificities at the level of what genes are expressed and the way those cell's genomes are chemically modified. These four UM subsets correlate with different outcomes and an increased risk of metastasis development (from lower-risk Disomy 3, to higher-risk Monosomy 3). Poor-prognosis Monosomy 3 has a very specific molecular makeup, a finding that will be invaluable for further research on UM biology and treatment, but also in advancing diagnosis of patients at high-risk of metastasizing for inclusion in earlier adjuvant treatment and clinical trials. Why is this paper important for UM patients? Because — aside from its contribution in advancing our understanding of UM biology — it will allow for a more detailed categorization of patients, according to the molecular makeup of each individual UM case. This information can then be used for selection of patients for increased surveillance and early detection of metastasis, as well as inclusion in future clinical trials for adjuvant therapies. How does this study fit in with the work being carried out by UMCure 2020? The main mission of UMCure 2020 consists in identifying new therapies for patients with metastatic UM. As a rare disease, there is a clear lack of therapeutic options, a void the Horizon 2020-financed UMCure 2020 project purports to fill. The present study is an integral part and result of that mission, as — with the participation of the Institut Curie, the University of Liverpool and the Leiden University Medical Center, three UMCure 2020 partner institutions and major UM referral centres — UMCure 2020 strives to bring higher insight and therapeutic options to metastatic UM. It was already known that UM displays an array of chromosome aberrations and gene mutations that correlate with clinical outcome. 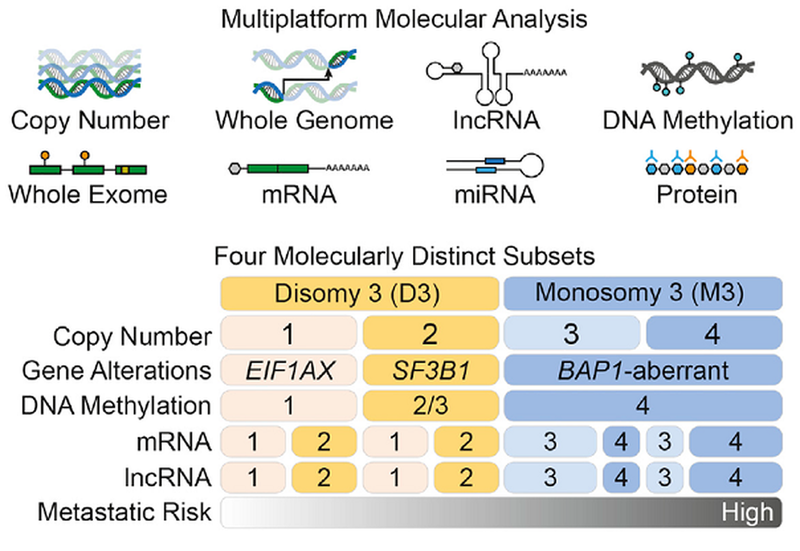 Monosomy 3 (M3-UM) and disomy 3 (D3-UM), as well as mutations in the BAP1, EIF1AX and SF3B1 and SRSF2 genes are prevalent in different UM cases and result in different patient outcomes as they are associated with different rates of metastatic risk. However, an integrative and large-scale approach — bringing together a complete army of biochemical techniques to fully molecularly characterize UM tumours from a wealth of patient-derived samples — had never been attempted for UM under The Cancer Genome Atlas Project (TCGA) in its Rare Tumour Projects. Primary tumour samples, together with matched blood for examining germline DNA, were collected from eighty patients from six biomedical and clinical institutions in the USA and Europe. (Patients who had been treated with either chemotherapy or radiotherapy prior to tissue procurement were excluded from the study) Case summaries with anonymous patient data, as well as pathology, molecular clinical and metastatic data, may be found in the article’s online supplementary material (Table S1). Unsupervised clustering of somatic copy number alterations (SCNAs) separated the 80 primary UM into four distinct clusters or subtypes (numbered 1 to 4) with diverse aneuploid events, effectively dividing the M3-UM and D3-UM groups into two subgroups each (Figure 1A). Using matched tumour-blood pair samples, nine significantly mutated genes (SMGs) were identified, including BAP1, EIF1AX, SF3B1 and SRSF2, but also the previously described and mutually exclusive somatic mutations in the GNAQ and GNA11 genes. These gene mutations revealed a further and often mutually exclusive pattern, with EIF1AX and SF3B1 mutations mostly present in different UM cases. By comparing RNA-Seq data from UM samples with mutations in the SF3B1 and SRSF2 genes versus UM samples with wild-type — that is, non-mutated — versions of these genes, it is shown that these mutations, which impact on splicing of mRNA molecules, may alter translation initiation in UM. Consistent with previous literature, it is shown that mutations in the BAP1 gene strongly correlate with M3-UM, additionally demonstrating that chromosome 3 monosomy occurs before BAP1 alterations (Figure 1B, 1C and 1D). Unsupervised clustering of methylated DNA (here indicated as CpG probes) resulted in a four-cluster solution (Figure 2). EIF1AX were only present in cluster 1, whereas UM cases rich in methylation groups 2 and 3 were enriched in SF3B1 and SRSF2 gene mutations. M3-UM, which clearly correlated with BAP1 alterations, was segregated on a class of DNA methylation of its own, group 4. RNA-Seq data for mRNAs and long non-coding RNAs identified four clusters for both mRNAs and lncRNAs (again, numbered 1 to 4). D3-UM cases were subdivided in clusters 1 or 2, while M3-UM cases were subdivided in either clusters 3 or 4 (Figure 3). Sequencing of miRNAs also identified four consensus clusters, all of which were associated with M3-UM and its methylation state described above. Particularly noteworthy was the association of the identified miRNA cluster 4 with immune infiltration, suggesting that the expression of specific sets of these small RNA molecules may be involved in the development and maintenance of an immune environment necessary for the progression of aggressive UM. A population comprised of a specific class of immune cells called CD8 T lymphocytes was identified as infiltrating approximately 30% of M3-UM tumours while being absent in D3-UM tumours (Figure 4). Additionally, genes involved in regulating many other aspects of immune responses were found to be coexpressed with the CD8A gene (which encodes a glycoprotein important in cell-cell interactions within the immune system). By analyzing RNA and protein expression to identify signaling pathways and molecular regulators important in UM, samples were segregated in four major groups, with a fifth more heterogenous group also identified (Figure 5). In one of these clusters, DNA damage repair/response, as well as MYC signaling (both molecular pathways implicated in tumour progression) were active and consistent with a typically upregulated hypoxia response observed in cancer as tumours grow and their blood supply becomes insufficient. Many other signaling pathways involved in immune responses in poor-prognosis M3-UM cases were pinpointed, further helping to characterize the specificities of this group of UM cases which, although sharing a similar global DNA methylation profile with another cluster, had distinct cellular signaling particularities. GNAQ and GNA11 gene mutations were also enhanced in M3-UM/BAP1-aberrant UM cases. As expected and previously described, M3-UM cases had a significantly worse prognosis than D3-UM cases, with features such as histological type and macrophage infiltration as prognostic factors in this study as well as they were in the clinical setting (Figure 7). Genes whose expression was associated with differential time to UM metastasis were also identified (genes coding for 111 mRNAs and 23 lncRNAs), more specifically genes segregating M3-UM SCNA clusters 3 versus 4 while still, predictably associated with UM metastasis. 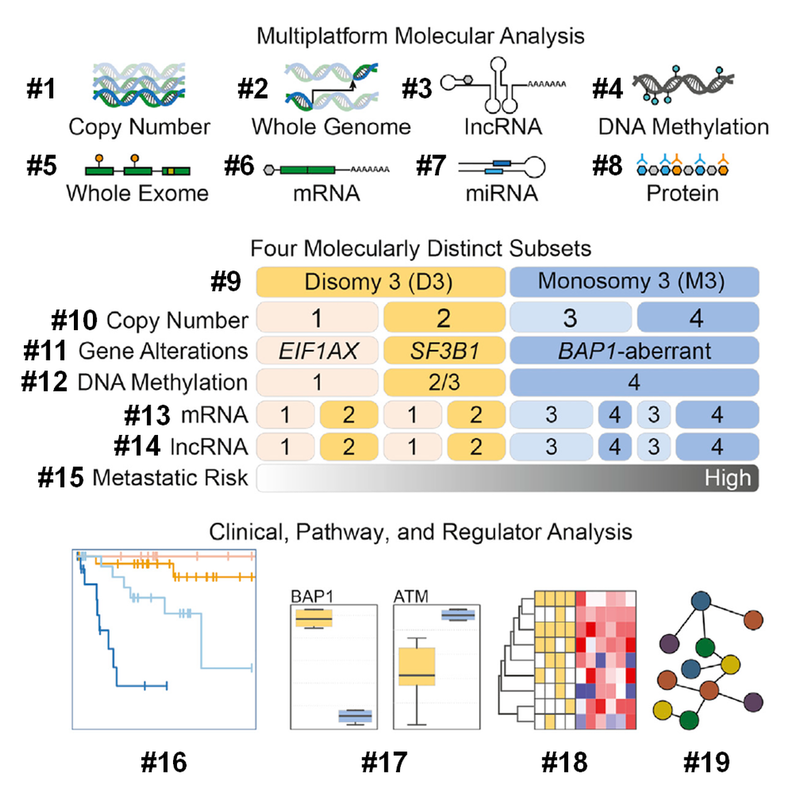 Our integrated, multidimensional molecular and computational investigation into UM provides insights that have mechanistic, prognostic, and therapeutic implications. The analysis divided primary UM tumors into four molecular groups, subdividing poor-prognosis M3-UM and better-prognosis D3-UM into two subgroups each. We show that poor-prognosis M3-UM is associated with a distinct global DNA methylation pattern that differs from the pattern observed in D3-UM, suggesting that BAP1 aberrancy may result in metastasis-prone DNA methylation state. M3-UM cases, despite sharing a characteristic global DNA methylation profile, were divided by SCNA-based and transcription-based analyses into two subgroups that have different biological pathway profiles and clinical outcomes. Developing a clinically relevant classifier will require prospective evaluation of copy number and/or gene expression data in tumors with similar clinical-pathological features to identify patients with higher- versus lower-risk M3-UM, and to validate the differential UM metastasis intervals observed in this study. Such a classifier could influence the frequency of metastatic surveillance, prioritize high-risk patients for more aggressive/earlier adjuvant clinical trials, provide more precise UM metastasis data for the design of clinical trials and use of historical controls, and offer information to patients that may assist them in medical and personal choices. As no effective adjuvant therapy has yet been developed for UM, a prospective analysis of characterizing these two molecular subtypes relative to UM metastasis is especially timely and important. Aneuploid events: presence of an abnormal number of chromosomes. CD8 T lymphocytes: a type of white blood cell known as cytotoxic T cell due to its function in eliminating damaged cells, such as cancer or infected cells. Disomy 3: presence of both copies of chromosome 3; in the context of UM, it is known as D3-UM. Germline DNA: an easily accessible source of material for identification of patient-specific gene mutations that exist in the patient’s constitutional DNA, present in all cells of the patient’s body and transmissible to the next generation. CpG probes: molecules used to detect methylated DNA, pinpointing any location in the genome where a cytosine nucleotide, C, which may be methylated, and followed by a guanine nucleotide, G (with “p” standing for the phosphate molecule that separates those two nucleotides). Immune infiltration: mechanism whereby tumours are infiltrated by cells from the immune system — such as macrophages, lymphocytes or mast cells — manipulating the physiological environment in which the tumour grows. Long non-coding RNAs (lncRNAs): RNA molecules that do not encode amino-acid sequences and thus do not result in protein expression. miRNAs: small non-coding RNA molecules known as microRNAs, containing about 22 nucleotides, responsible for RNA silencing — “silencing” or turning down the expression of specific genes — and post-transcriptional regulation of gene expression. Monosomy 3: loss of one copy of chromosome 3; in the context of UM, it is known as M3-UM. Nucleotides: the building blocks of nucleic acids (DNA and RNA); DNA segments are composed of combinations of four nucleotides (adenine, cytosine, guanine and thymine, represented, respectively, by the letters A, C, G and T); in RNA, thymine is replaced by uracil (U). RNA-Seq: a technique through which RNA is converted to cDNA — complementary DNA, as it is complementary, base by base, with the matching RNA molecule — and then used in next-generation sequencing, thus quantifying, discovering and profiling RNA molecule. Somatic copy number alterations (SCNAs): changes in the number of copies of a certain segment of the genome that have arisen in a specific somatic tissue, in this case UM tumours. Unsupervised clustering: method of data analysis that allows information to assemble in segregated groups without any interference or bias from the experimentalist. Digest of the Graphical Abstract of the study "Integrative Analysis Identifies Four Molecular and Clinical Subsets in Uveal Melanoma"
#1 — Copy number alterations: somatic copy number alterations (SCNAs) or changes in the number of copies of a certain segment of the genome that have arisen in a specific somatic tissue. #2 — Whole genome sequencing: technique whereby the complete DNA sequence of an organism’s genome is determined at a single time. #3 — lncRNA profiling: description of the complement of long non-coding RNAs (RNA molecules that do not encode amino-acid sequences and thus do not result in protein expression) within the entire population of RNA molecules in an organism by use of RNA-Seq (a technique through which RNA is converted to cDNA — complementary DNA, as it is complementary, base by base, with the matching RNA molecule — and then used in next-generation sequencing, thus quantifying, discovering and profiling RNA molecules). #4 — DNA methylation profiling: description of the genomic pattern of methylation (addition of a very small molecule, called a methyl group, to DNA) in a genome through bisulfite sequencing (where, prior to being sequenced, DNA is treated with sodium bisulfite, converting cytosine nucleotides into uracil nucleotides whilst leaving 5-methylcytosine nucleotides unnaffected, resulting in DNA sample that only retains methylated cytosines). #5 — Whole exome sequencing: genomics technique whereby only the subsets of DNA that encode proteins in a certain organism — called exons — are sequenced. #6 — mRNA profiling: description of the entire complement of mRNAs — RNA molecules that encode amino-acid sequences — in an organism through conversion of RNA molecules to cDNA (as explained above) and then used in next-generation sequencing, thus quantifying, discovering and profiling RNA molecules. #7 — miRNA profiling: description of the complement of microRNAs (miRNAs, small non-coding RNA molecule, containing about 22 nucleotides, responsible for RNA silencing — “silencing” or turning down the expression of specific genes — and post-transcriptional regulation of gene expression) within the entire population of RNA molecules in an organism by use of RNA-Seq (as described above). #8 — Protein expression profiling: description of the entire protein complement of an organism by use of Reverse-Phase Protein Arrays (RPPA, which enables the measurement of protein expression levels in large-scale through specific antibodies that bind to the proteins being assayed). #9-15: Embedded throughout the results section in the explanatory text above. #16: Kaplan-Meier plots (a statistical test used to estimate the survival function from lifetime data) for the clinical event of UM metastasis for M3- versus D3-UM, as well as for unsupervised clusters for DNA methylation, SCNA, lncRNA, and mRNA. #17: Box plots illustrating the distribution of data for specific proteins as part of signalling pathways involved in UM development. #18: Heatmaps (graphical representations of data where the individual values contained in a matrix are illustrated as colors) representing the relationship between different molecules and cellular pathways. #19: Correlation network maps showing the functional interactions between different cellular pathways and molecular regulators in UM.